I just heard today that one of my personal heroes has passed. After suffering a massive stroke last week, Hadji apparently passed a few days ago. I was fortunate to count him among my friends and have to say, he was a constant inspiration. Hadji was one member of a crew, inspired by Skeeter, to return to surfing later in life. The crew, including Billy Goldsmith, Captain Dan, Black Mac, Bud Powell, Ron St. John, Larry Gordon, IRS Dave, John Bishop, Inge, Mary Helen and Dave Ish, and a host of others I’m not remembering at the moment, were always a constant presence at Tourmaline in the mornings. 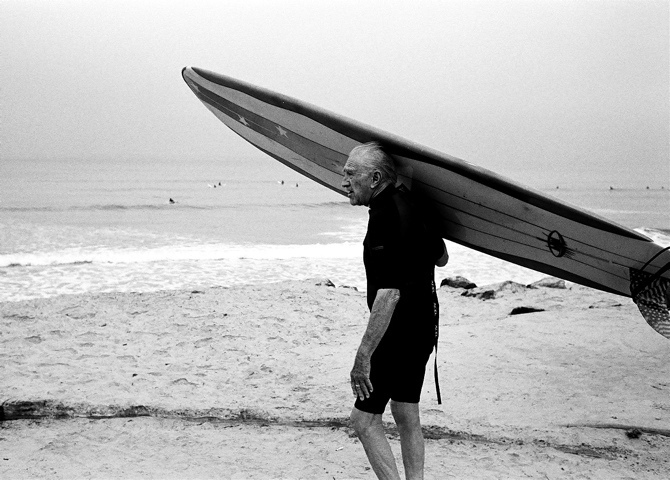 They were a concrete link to the history of surfing and ocean lifestyle in San Diego. Hadji will always embody the positive attitude and joy that surfing brings to life. I had the honor and pleasure of sharing many sessions with him and the rest of the boys and will treasure the memories forever.